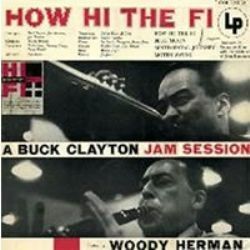 The Buck Clayton LP How Hi The Fi was the first issue in 1954 from the famous Buck Clayton jam sessions. It was recorded at Columbia’s 30th Street Studios, which was one of the greatest recording sites in the world (the studio has since been abandoned, which must be one of the most stupid decisions executed by the corporate record industry), with a sound that’s still instantly recognizable. These Buck Clayton jam sessions were among the first large scale projects to utilize the potential of the new LP technology. The exciting music on this long-out-of-print LP is now available again on 180-gram vinyl, with the cuts “How Hi The Fi” and “Blue Moon” being the most memorable. Buck and fellow musicians are all in inspired form. The most memorable soloists are the rambunctious Trummy Young, the harmonically advanced chording’s of Jimmy Jones and an exuberant Woody Herman who was rarely heard in this type of jam session setting. With Clayton having worked out some ensemble riffs for the horns beforehand and plenty of space left for spontaneity, this music is timeless magic.